Photograph collection of webmaster. 25282 heads eastbound at Guide Bridge on a gloomy, damp March 12th 1980. The twenty one year career of D7632/25282 started with about two years at Sheffield area depots before migrating to the LMR, spending lengthy periods at Springs Branch & Bescot. Built: BR Beyer Peacock Ltd, Manchester (Works No.8042). Second Class 25 to carry TOPS renumbering, September 1973. Time between last Classified repair and withdrawal: 93 months. Time between withdrawal and scrapping: 36 months. August 1967 to London Midland Midland Lines (LMML). September 1967 to Birmingham Division (D02). June 1968 to Springs Branch (8F). 25282 was the 275th Class 25 withdrawn, one of six retired during March 1986. 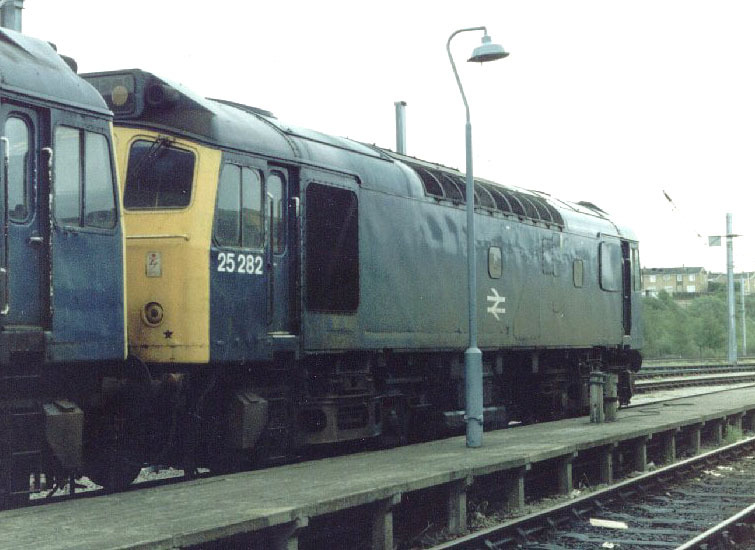 After withdrawal 25282 was stored at Crewe until moved to Carlisle Kingmoor by October 1986. A brief visit to Upperby took place on November 11th 1988, then returned shortly after to Kingmoor. On December 7th 1988 25282 began its final journey, to Vic Berry, Leicester via Workington, Carnforth and Basford Hall, entering Vic Berry's yard on December 20th 1988. By the middle of March 1989 25282 had been scrapped. Photograph collection of webmaster. 25282 at Carlisle Kingmoor on May 27th 1986, having been withdrawn for about two months. Photograph courtesy Gary Thornton. Delivered from Gorton in October 1965, 25282's existance ended like many others in Vic Berry's yard at Leicester. Noted Crewe Works June 1969. Noted Derby Works June - August 1973. Noted Derby Works May - June 1978 (Classified). Noted Derby Works July & August 1982 (N6 repairs). Noted Derby Works May 1983. Recorded passenger mileage for 7632/25282 started off slowly but proved in its later years to be a well travelled machine. Like many originally allocated to the Sheffield area depots it was used on the summer dated service from Sheffield to Llandudno Town being so noted on June 25th 1966. The TOPS renumbering scheme had in practice been applied very slowly to the locomotive fleet, principally to locomotives going through the major workshops. 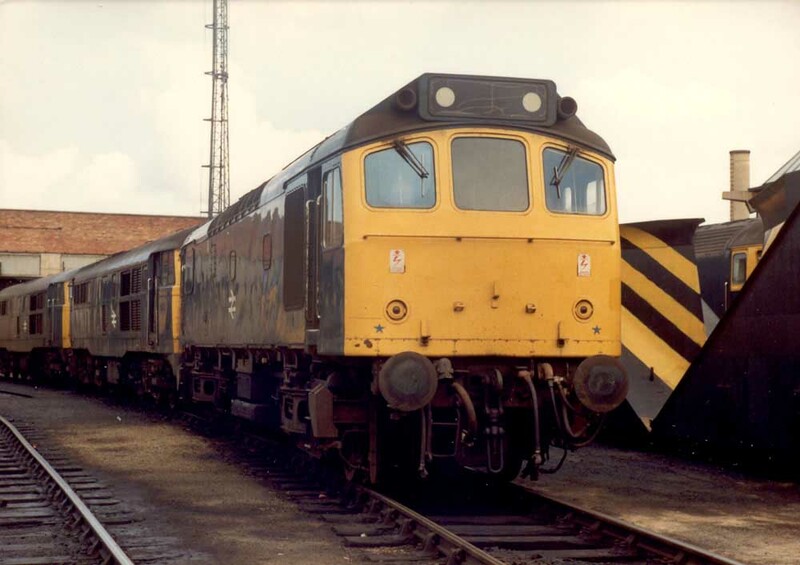 During September the first Class 24 was renumbered, 24041 after visiting Derby Works for an overhaul, as were the first Class 25’s 25208(7558) & 25282(7632). On October 26th the 07.48 Liverpool - Edinburgh failed near St Helens Junction behind 47474. 25282 dragged everything to Wigan North Western where 86241 took over. On August 9th 25282 & 25247 worked the 09.20 Manchester Piccadilly - Yarmouth as far as Lincoln, and returning with the 09.15 ex Yarmouth. The month of April saw the Widnes – Polmadie BOC working feature mixed pairs of locomotives including 25282 & 40055 on April 24th. On August 24th whilst possibly deputising for a failed diesel multiple unit, 25282 and two coaches worked the 06.23 Shrewsbury - Swansea. On September 11th 25282 worked the 09.00 Llandudno Town - York. 25282 worked the 06.00 Crewe - Cardiff on July 4th. On August 13th 25282 was noted at Scarborough with a breakdown train. Permanent way work between Warwick and Hatton on September saw 25074 + 25132 and 25136 + 25282 in use. 25282 was noted at Oxford on July 14th with an unidentified passenger service. A surprise amongst the regular haulage occurred on July 22nd with 25282 & 25276 working the 08.45 Birmingham New Street - Paignton throughout, then delivering the empty coaching stock to Newton Abbot. Three of the four weekends during August found 25282 out and about. On August 5th it was busy on a roundtrip over the Cambrian lines with 25325. The next weekend (August 12th) 25282 joined forces with 25289 for another round trip over Cambrian metals. Two weeks later there was a change of venue, on August 26th 25282 & 25261 worked the 08.00 Walsall - Yarmouth to Norwich, returning with the 14.15 Yarmouth - Derby from Norwich. However 25282 failed near Ancaster, with both Type 2s replaced by 46004. Whatever caused the problems with the pair of locomotives had been fixed by August 29th since they went out on the 09.53 Nottingham - Skegness relief, outward leg only. 1979 opened with railtour duty, on February 11th 25282 & 25277 worked the Paddington - Crewe 'Crewe Campaigner Relief' between Birmingham New Street & Crewe. They returned to Birmingham with the 'The Crewe Campaigner'. 25282 & 25309 were stabled at Wolverhampton High Level on June 17th. On June 22nd 25282 was noted southbound through York station with a train of repaired diesel multiple units. Another significant working was a roundtrip Blythe Bridge - Blackpool day excursion on July 4th (roundtrip assumed). On July 14th 25282 & 25289 worked the 04.15 Shrewsbury - Aberystwyth and the return 10.09 Aberystwyth - Euston to Wolverhampton. On August 2nd a day excursion behind 40034 failed at Bay Horse, 25282 assisted from Lancaster to Carnforth, with an electric locomotive on a parcels train having pushed the train to Lancaster. On February 25th the 09.00 Euston - Carlisle with 86229 was dragged between Nuneaton & Coventry by 25282 following some sort of diversion. On June 1st 25282 & 25259 worked the 08.45 Birmingham New Street - Aberystwyth and the return 18.10 Aberystwyth - Euston as far as Machynlleth where 25282 failed and was replaced by 25325. Two weeks later on June 15th 25282 & 25307 worked the 08.45 Birmingham New Street - Aberystwyth (via Bescot), returning with the 18.10 Aberystwyth - Euston to Wolverhampton. On July 19th the 10.10 Euston - Aberystwyth from Birmingham New Street and the return 16.10 Aberystwyth - Shrewsbury were worked by 25282 & 25194. The next day (20th) the same pair worked the 08.45 Birmingham New Street - Aberystwyth from Shrewsbury (? ), returning with the 18.10 Aberystwyth - Euston to Wolverhampton. On July 25th a Scarborough - Leamington Spa day excursion was worked by 25282 & 25289. THe next day (26th) the same pair worked the 07.40 Euston - Aberystwyth from Wolverhampton returning with the 17.55 Aberystwyth - Wolverhampton. The 10.10 Euston - Aberystwyth from Birmingham New Street and the return 16.10 Aberystwyth - Shrewsbury were worked by 25282 & 25194 on August 16th. On January 17th a light engine movement of 25282, 25297, 47128 & 47145 were noted southbound through Leamington, en-route to the Banbury area for weekend engineering trains. 25282 received an 'E' examination at Toton during May. Photograph courtesy Jerry Glover. 25282, 31153 & 31275 at Thornaby on June 28th 1981. After storage at Crewe it moved to Vic Berry's, Leicester and was broken up there during March 1989. On August 22nd 25282 & 25262 worked the 07.40 Euston - Aberystwyth from Wolverhampton, returning with the 16.05 Aberystwyth - Wolverhampton. On August 27th 25282 was noted southbound at Renishaw with carflats. Two days later on August 29th 25282 & 25296 worked the 10.10 Euston - Aberystwyth from Birmingham New Street, returning with the 18.00 Aberystwyth - Wolverhampton. On February 10th 25282 worked the 07.40 Barrow - Liverpool throughout. 25282 was stabled at York on March 16th. The class were still frequent visitors through Hereford, noted was 25282 on a Severn Tunnel Junction – Walton freight on May 25th. Whilst on this working 25282 had pushed failed 47273 with a Margam - Dee Marsh steel coil train into Woofferton loop. 25282 returned to the northwest at the end of May in support of the visit by the Pope to Manchester. On May 31st as part of the half hourly service on the Blackpool line 25282 worked the 15.15 Manchester Victoria - Blackpool and the return 17.40 service. On September 18th 25282 was north of the border working the 11.50 Aberdeen - Carstairs forward from Edinburgh, being a portion for the 15.23 Glasgow - Nottingham. April 1983 produced four workings for 25282, on April 2nd the 22.45 Liverpool - Crewe electric multiple unit failed at Weaver Junction, 25282 assisted to Crewe. On April 18th/19th/20th 25282 worked the 22.47 Crewe - Blackpool forward from Preston. 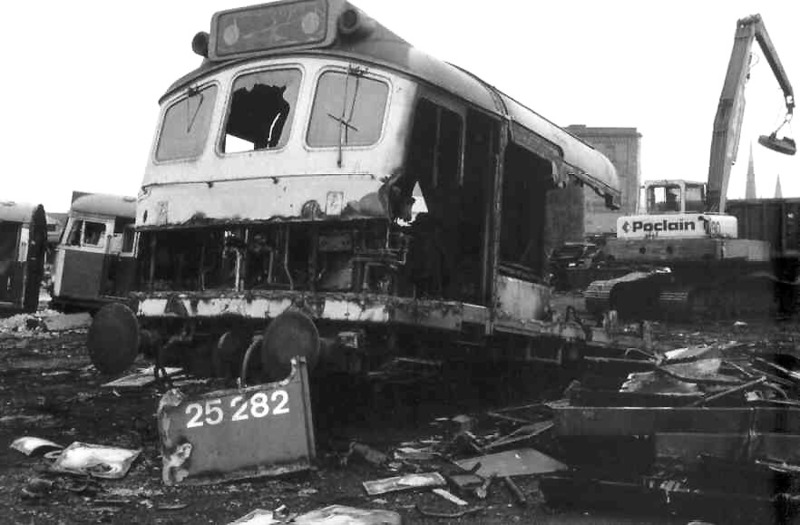 On April 24th 25282 & 25284 were stabled at Guide Bridge. 25282 was the Manchester Victoria pilot on August 2nd. The weekend of August 9th/10th also proved busy for 25282, on 9th working the 09.15 Bangor - Scarborough from Manchester Victoria to Leeds. The next day 25282 worked the 09.37 Derby - Skegness relief and 18.10 ex Skegness return. On November 4th the 17.03 Euston - Blackpool North was worked forward from Preston by 25282. On January 26th 25282 & 40058 worked the Ditton - Broughton Lane BOC tanks. The first passenger working in 1984 for 25282 occured on March 15th with the 10.20 Crewe - Derby, covering for a diesel multiple unit failure. 25282 was noted southbound at Farington with a train of 100 Ton Bogie Tank Wagons on May 12th. 25282 was stabled at Cockshute on June 2nd. On June 16th the 10.10 Euston - Shrewsbury was worked forward from Wolverhampton by 25282 & 25322. 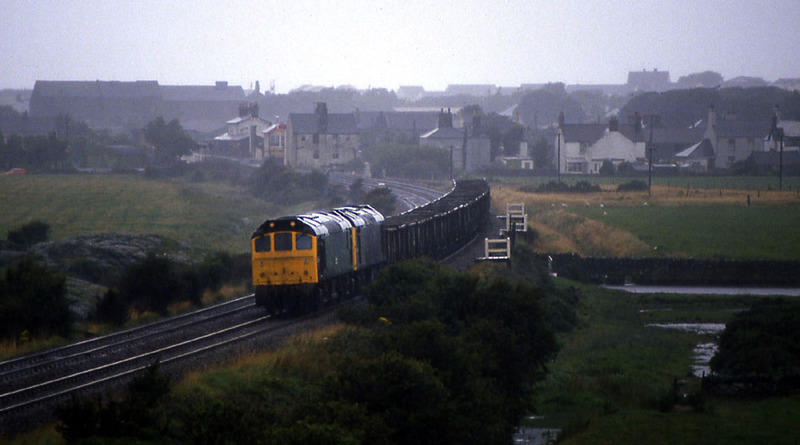 A week later on June 23rd a Bournemouth - Blaenau Ffestiniog railtour was worked from Llandudno Junction to Blaenau Ffestiniog with 25282 piloting 47407 due to heavy rain and slippery rail conditions. 25282 & 25259 worked the 6V32 14.55 Ellesmere Port - Severn Tunnel Junction oil tanks on July 17th. The 10.10 Euston - Aberystwyth from Wolverhampton and the return 17.05 Aberystwyth - Shrewsbury were worked by 25282 & 25324 on July 21st. Five days later on July 26th a Derby - Aberystwyth day excursion was worked roundtrip Wolverhampton - Aberystwyth by 25282 & 25251. Two days later (28th) the same pair were on the Cambrian line working the 07.44 Shrewsbury - Aberystwyth, however 25251 failed at Machynlleth and was removed, leaving 25282 to work alone on the 10.10 Aberystwyth - Euston to Wolverhampton. A Kidderminster - Tenby day excursion on August 1st was worked Kidderminster - Llanelli and Cardiff - Kidderminster by 25282 & 25279, a total of 348 passenger miles. On August 11th 25282 & 25254 worked the 07.44 Shrewsbury - Aberystwyth and the return 10.10 Aberystwyth - Euston to Wolverhampton. On September 1st 25282 & 25193 worked the 07.44 Shrewsbury - Aberystwyth and the return 10.10 Aberystwyth - Euston to Wolverhampton. 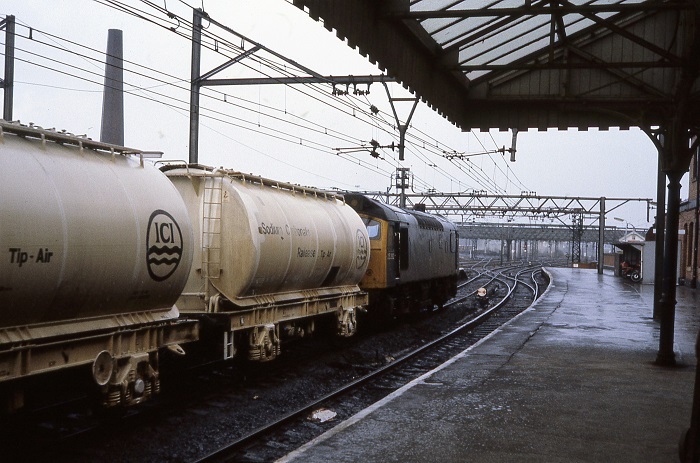 Scunthorpe was host to 25282 in charge of ten bogie oil tankers on February 19th. On March 26th 25282 was noted hauling 47425 southbound through Durham. The trip freight from Healey Mills to Knottingley, normally a Class 31 or 47 working saw 25285 on September 13th and 25282 (23rd). When 31405 failed at Melton Mowbray on May 30th working the 13.21 Norwich - Birmingham New Street, 25282 took over for the remainder of the journey, 25282 had also been noted southbound through Loughborough on this day. Four days later 25282 was back on the same route, rescuing 31433 at Nuneaton whilst working the 08.10 Birmingham New Street - Norwich, with 25282 working through to Norwich. 25282 worked the lengthy 11.50 Moreton On Lugg - Severn Tunnel Junction Class 9 freight on June 6th. On July 6th the 13.40 Aberystwyth - Wolverhampton was worked forward from Shrewsbury by 25282 & 25192. 25282 was noted passing Monks Siding Signal Box with loaded cartics from the Ford plant at Halewood on July 16th. Photograph courtesy Steve Morris. 25282 & 25265 race westwards through Valley under threatening skies on August 11th 1985. On August 12th 25282 was noted at Derby with a short parcels train (the evening Manchester - St Pancras parcels?). On August 23rd 25282 was stabled at Machynlleth. The final passenger working for 25282 took place on October 5th working the 15.20 Tenby - Wolverhampton 'Welsh Borderer' charter forward from Cardiff to Wolverhampton with 25296. On October 30th 25282 was noted passing Betws y Coed with a four wagon freight on October 30th. 1985: December ?? On an unreported date 25282 and three loads of sleepers visited Coundon Road sidings, via Three Spires and Coventry, possibly the first visit of train here in over twenty years. 25282 was withdrawn on March 10th 1986. No.2 cab front: circular patch of paint missing from area left of centre lampbracket February 1979 until withdrawn. Non BIS side: lengthy shallow scrape just above frame level from radiator to center of bodyside (not present March 1983) September 1984 until withdrawn. Page added February 10th 2013.